1875–1956, American archaeologist, historian, and statesman, b. Honolulu; son of Hiram Bingham (1831–1908). He was educated at Yale (B.A., 1898), the Univ. of California (M.A., 1900), and Harvard (M.A., 1901; Ph.D.
Perhaps the most spectacular ruin in the Americas, Machu Picchu spreads over 5 sq mi (13 sq km), with over 3,000 steps linking its many different levels. It shows admirable architectural design and execution, including a terracing system built on extremely steep terrain; it has been estimated that 60% of the effort expended on construction was devoted to creating the terraces. It also contains rare examples of religious monuments, including a carved stone (the Intiwatana), a small tower (the Torreón), and a cave with a masonry entrance (the Intimachay). Such indigenous shrines were generally destroyed by Spanish authorities. Archaeological and historical evidence indicates that it represents a mountain retreat of the Inca leader Pachacuti Yupanqui, who ruled c.1438–1471. Investigators have suggested the site may have served as a religious sanctuary and that the masonry windows at two of its monuments may have been aligned so as to define the June and December solstices. Experts do not agree whether the numerous steep walls at Machu Picchu and surrounding Inca sites were built as military fortifications or simply to delimit the boundaries of these special state installations. See H. Bingham, Lost City of the Incas (1948, repr. 1969); C. Heaney, Cradle of Gold (2010). The most celebrated Inca citadel, on a promontory 2,000 feet above the valley in the Andes in Peru. The site includes buildings which surround an oblong plaza. The houses were built around courts, with stairs, windows, interior niches, narrow doorways and thatch-covered gable roofs. Some houses were carved out of the rock; some connecting stairs were hewn out of the mountain. These remains of the city of Machu Picchu date back to the Inca Empire in the fifteenth century. The site is believed to have been an important religious center. Today, it has also come to be a spiritual place in the eyes of modern New Agers. Aurora/Getty Images. Machu Picchu is a medieval Inca site, most likely a royal religious retreat center used around 1460 CE, located high in the Andes some fifty miles northwest of Cuzco, Peru. It is off the beaten track and lacks any governmental, economic, or military value—hence the belief that it primarily served as a religious center. Adding to its mystique is that it remained unknown to the larger world until the beginning of the twentieth century. It was missed by Spanish forces who overran the territory in the 1530s and by subsequent Peruvian governments, which had little reason to extend their hegemony into sparsely populated areas. It was discovered in 1911 when an archeologist working the area was invited to the site by the local residents. Hiram Bingham (1875–1956) was shown an abandoned site that was largely intact. The site includes a central plaza and an adjacent temple surrounded by a variety of buildings, apparently living quarters for religious leaders, royalty, and other important persons. A large altar stone is located in the temple. The whole complex sits on a ridge between two high peaks. It appears to have been seen as the home of a powerful mountain spirit whose acknowledgment was integrated into the worship of the sun. It also appears that it was a special place for a group of virginal females (the Chosen Women) who were specialists in the Inca religion. 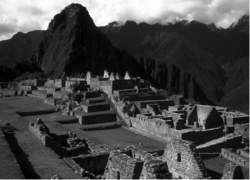 The exact nature of what occurred at Machu Picchu remains a matter of speculation. However, students of archeoastronomy have claimed the site was used for astronomical observations. Protruding from the altar in the temple is the Intihuatana stone (called the “Hitching Post of the Sun”), which some assert to be an indicator of various notable stellar occurrences, especially the summer and winter equinoxes. At midday on the equinoxes (March 21 and September 21), the sun is directly above the pillar, erasing its shadow. Thus the sun can be viewed as sitting upon the pillar and at that moment “tied” to the altar. During the last generation, exponents of contemporary Esotericism (the New Age movement) have seen Machu Picchu as a site possessing particular spiritual power. They have spearheaded pilgrimages to the remote location and have invested the region with a variety of religious values. It is seen as a place of transformation or openings to spiritual awareness, and a land of not only geological but spiritual highs. Harking to Chinese ideas of Feng Shui, tour leaders see the region as the focus of natural energies that flowaround the high peaks, through underground openings, and suffusing the nearby valleys. Bingham, Hiram. Lost City of the Incas. New York: Duell, Sloan, and Pearce, 1948. Cumes, Carol, and Romulo Lizarraga Valencia. Journey to Machu Picchu: Spiritual Wisdom from the Andes. St. Paul, MN: Llewellyn Publications, 1998. Reinhard, Johan. Machu Picchu: The Sacred Center. Lima, Perú: Nuevas Imágenes, 1991. Waisbard, Simone. The Mysteries of Machu Picchu. New York: Avon Books, 1979. Wright, Ruth M., and Alfredo Valencia Zegarra. The Machu Picchu Guidebook: A Self-guided Tour. Boulder, CO: Johnson Books, 2001.
an Inca fortress city in Peru. It stands high above the valley of the Urubamba River, at the foot of Mount Machu Picchu, 75 km northwest of the city of Cuzco. It was discovered in 1911 by a Yale University expedition headed by H. Bingham and was excavated between 1911 and 1915. According to legend, Machu Picchu was constructed during the rule of the Inca Pachacutec (1438-71), but it is possible that it originated in preInca times. After Peru was seized by the Spanish, the city was the last stronghold of the Incas (up to 1572). Machu Picchu contains many monuments of late Inca architecture: a palace, temples, an “observatory” (a platform for astronomical observations), residences of the nobility, houses of commune members, and stairs and terraces carved into the cliffs. The most important structures were erected from carefully dressed granite blocks. Bingham, H. Lost City of the Incas: The Story of Machu Picchu and Its Builders. New York, 1948. And at 73 John was the oldest person to walk the Inca trail to Macchu Pichu. Only 13 days are spent at sea and ports of call include: Acapulco in Mexico, four days in Callao, Peru - from where you can take a trip to the remains of the ancient Inca citadel of Macchu Pichu - three days in Valparaiso in Chile, Port Stanley in the Falklands, three days in Buenos Aires in Argentina, two days in Rio de Janeiro in Brazil, as well as Barbados, Antigua and Martinique. This was also outstandingly good with magnificent scenery and enlightening shots of the local people, and I became wild with delight when Fry stood right in front of Macchu Pichu, as my grandson was there last year.